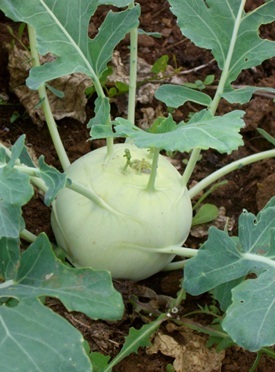 Kohl rabi are members of the brassica family, producing a turnip-like swollen stem or ’bulb’ above ground and is an interesting and versatile vegetable. The plant grows to about 30cm high and wide and the bulbs can have an outer skin of white, green or purple. They have a pleasant, mild flavour and can be eaten cooked or raw. The shoots can be cooked and eaten as ‘greens’. Kohl rabi is a cool climate vegetable grown as an annual, preferring light soils, though is likely to bolt in temperatures below 10o C. It withstands drought better than most brassicas and has lower nitrogen requirements. In mild climates, the seed can be sown outdoors in succession from spring to summer and later, using the hardier, purple varieties. It can be grown as a ‘catch crop’, using the soil after the main crop has been lifted, or as an ‘intercrop’. Sow seed directly into drills 30cm apart, thinning to about 20cm. Use the thinnings to fill gaps and the excess can be stir-fried. Little attention is needed other than weeding. They suffer pests and diseases similar to other brassicas. The crop may be ready for harvesting between five and nine weeks and may become ‘woody’ if grown larger than a tennis ball. In colder regions, they can be lifted in autumn and stored, leaving a tuft of leaves. Recommended varieties are Early White Vienna, Express Forcer, Early Purple Vienna and Rapid.